My apologies to all of you my beautiful loyal Cuisinicity fans, for not writing a brand new blog for this holiday season but I have been dealing with family issues and just got back from France to tend to my elderly Mom, so I hope you will forgive me and just read on my updated post with some of my latest additions this year for you! So this is it: the heart of the holiday season! …and you are thinking, assuming, that you have to abandon all hope of bringing a healthy dish to that next holiday party from fear that it will be the one remaining on the buffet table, untouched…shunned by all (including yourself!). All right, all right, a bit dramatic –I know! Still, you know what I mean, right? It doesn’t have to be so! There are many perfectly healthy and nutritious dishes that you may have loved all year long that you can just “dress up” a little to honor that festive table, and, all of a sudden, the array of choices is almost endless! This week, I am devoting my special to that “dressing up” and simply going through my repertoire of dishes and identifying for you those that I deem holiday worthy! I will include links to them at the bottom of this post. I am sharing several new ones I created this past year for you as well. 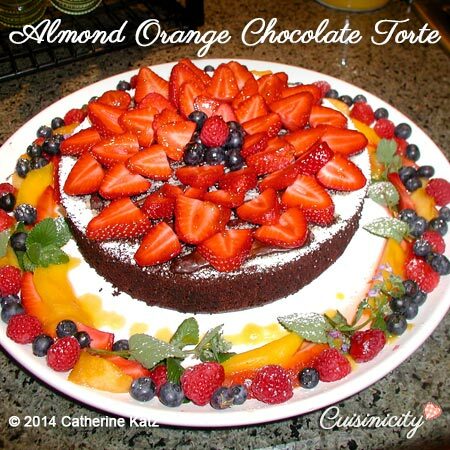 My Almond Orange Chocolate Torte and my Fresh Fruit Clafoutis are old favorites of mine that I created over 15 years ago and that have passed the test of time, gracing those holiday buffet tables with great acclaim! 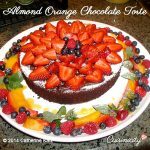 My Almond Orange Chocolate Torte is one dessert you will be able to “indulge” in without any guilt! 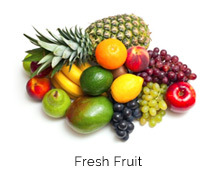 I love to dress it up with lots of fresh fruit and sprigs of fresh mint. It makes for a spectacular presentation, wouldn’t you say? 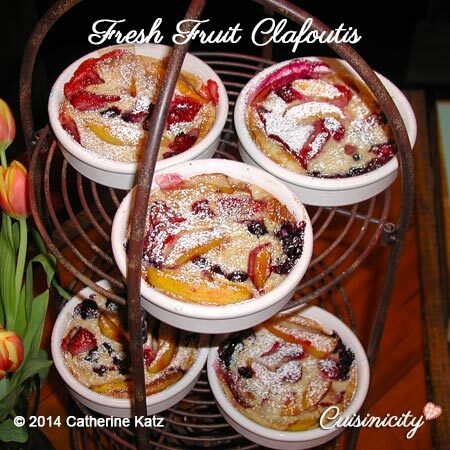 My Fresh Fruit Clafoutis is a hearty French peasant custard that I filled with fresh mango and blueberries instead of the traditional cherries, bypassing the cream, butter and loads of sugar of course. It is so festive on a buffet table, especially at Christmas time when people are just amazed to find such a luscious fresh fruit dessert! 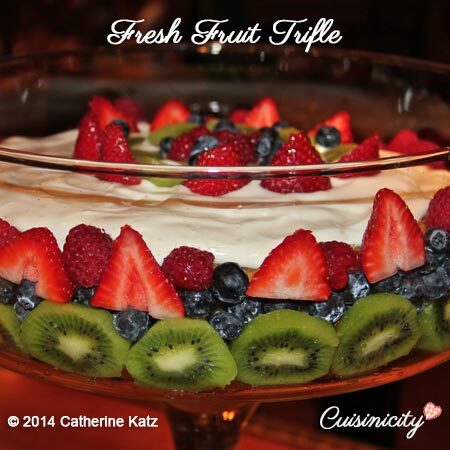 And of course, my splendid Fresh Fruit Trifle that I published early for you at Thanksgiving because you demanded it! The wine cake layers blend perfectly with the vanilla yogurt, the rhum and the fresh fruit so that it tastes decadently delicious (the rhum-embued cake reminds me of a French “baba au rhum” and the vanilla yogurt becomes so thick you’d think it’s heavy cream!). It is absolutely spectacular as a centerpiece on a dessert buffet table. It’s always a hit–never fails–so I proclaimed this one the Holiday Special WINNER, again this year! I also had a platter of chocolate-dipped biscotti–take a look in the background of the photo! 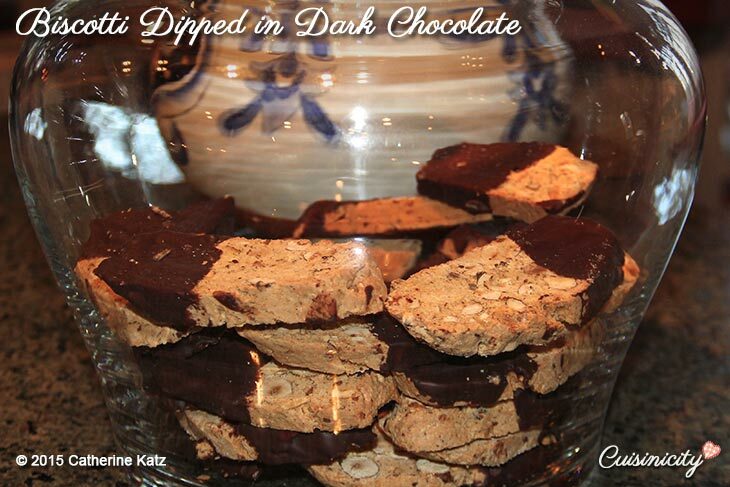 Here is the recipe: Biscotti Dipped in Dark chocolate. 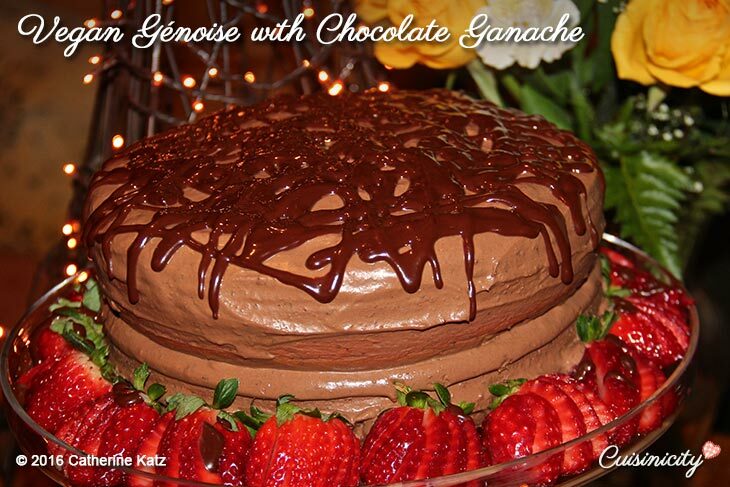 Another lovely dessert is my genoise, or sponge cake with chocolate ganache–vegan at that! Here is an appetizer that I absolutely LOVE and that your guests will too! 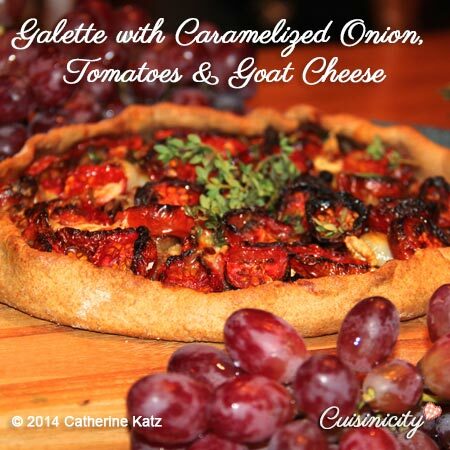 It is a rustic savory Galette with Caramelized Onion, Oven-Dried Tomatoes & Goat Cheese…..OH MY!!! It’s wonderful as an appetizer because you can slice it and eat it with your fingers–no need for silverware here! 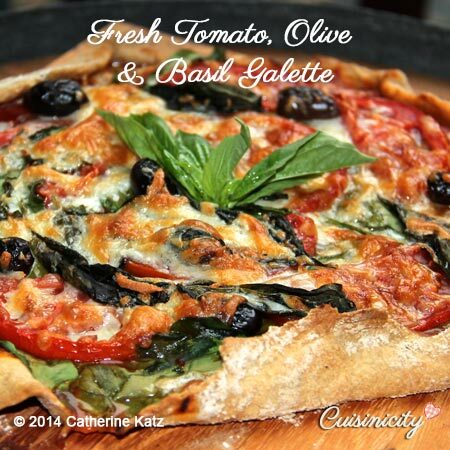 A variety on that theme is my Fresh Tomato, Olive and basil Galette–also delicious and so elegant! I also have the dessert version of a galette made with a variety of fresh fruit: strawberries, or cranberry apples, or plum, and even a vegan version of these luscious sweet galettes you can adapt to whatever fresh fruit you have access to at your local market in your part of the world: Here is one made with fresh peaches but you can also make it with apples, pears, strawberries. 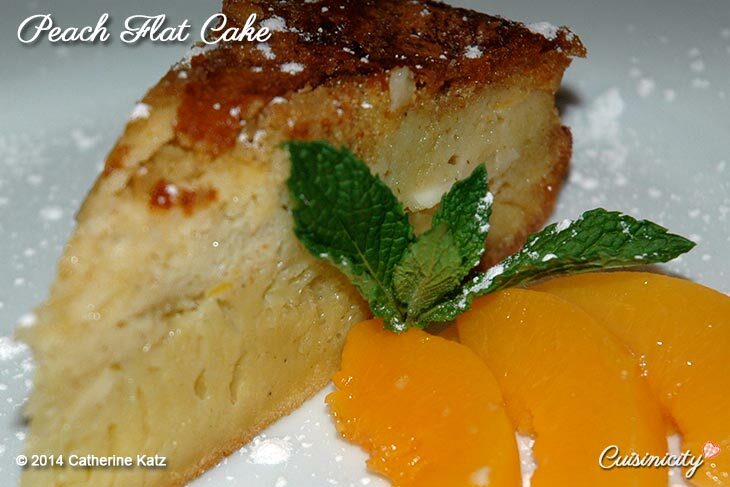 If you prefer to use canned peaches (in pear juice), and are OK with a non-vegan cake, here is a delicious Peach Flat Cake that is a wonderful crowd pleaser too! 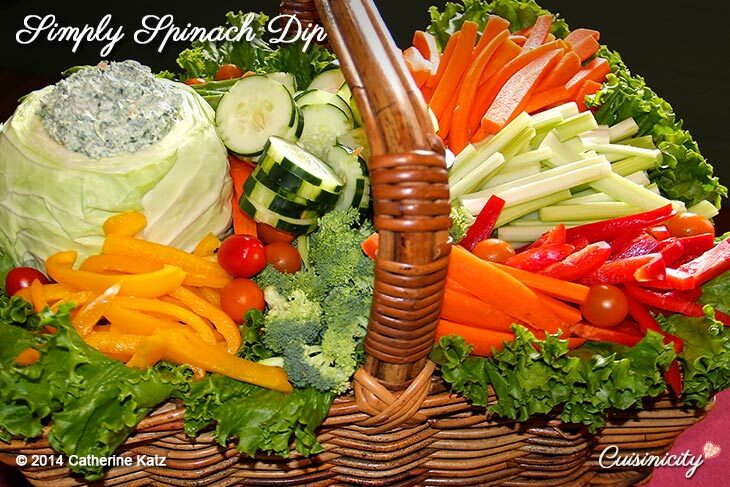 And of course there is that good ol’ standby crudités basket filled with fresh raw veggies and my delicious, amazingly rich-tasting (it’s fat free and has loads of organic fresh baby spinach!) Spinach Dip. I present it inside a hulled-out fresh cabbage. It is so simple and just so inviting, bursting with color! 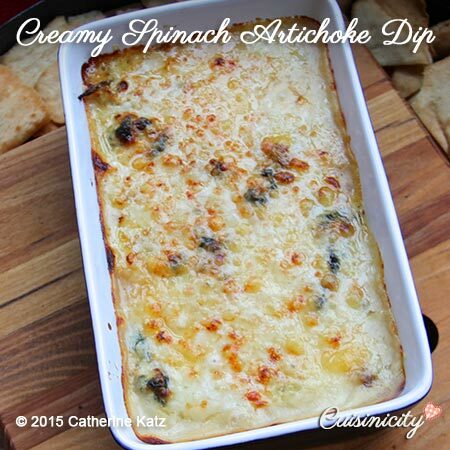 Another favorite is my Creamy Spinach Artichoke Dip….wow!! I love the combination of fresh spinach and artichoke and this creamy dip is absolutely marvelous! Not only that, I have made it as healthy as can be–no mayo, or cream, or cream cheese, or sour cream or any of those ingredients I have seen in most recipes for this dip. My Turkey Bean Pot-au-feu is SUPERB on a rustic holiday table by a fire. 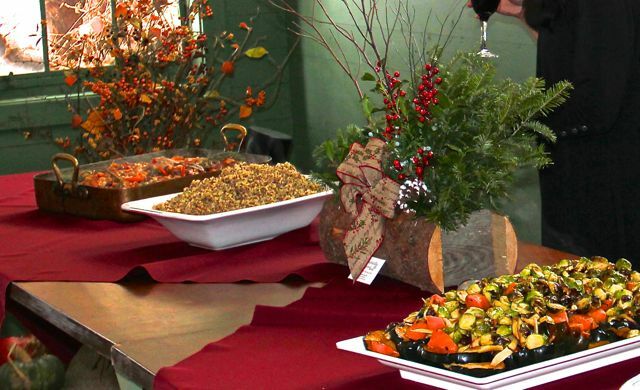 In fact, I did just that at a holiday party I hosted last year and it was a hit! Here it is, displayed in a beautiful copper pan, with my Simply Quinoa as a side dish and a beautiful platter of oven roasted root vegetables (you can inspire yourself here with any of my simply veggie recipes). 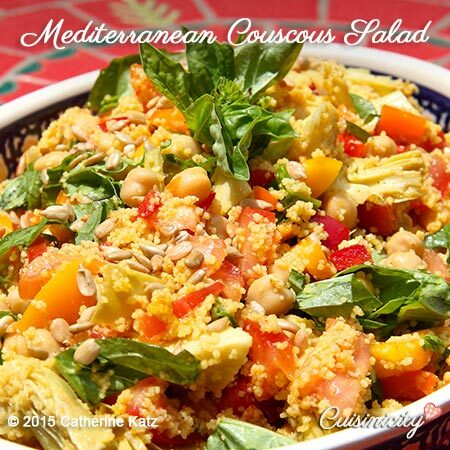 How special to this wonderful Mediterranean whole wheat couscous salad filled with artichoke hearts, bell peppers, tomatoes, chickpeas, fresh basil, and topped with roasted sunflower seeds! ….and I think I will let you go right to the links below to see for yourself how MAGNIFICENT these other ones with my mistletoe stamp of approval will look on your holiday table too! Apple Butternut Squash Soup (I served this creamy luscious soup as an appetizer in a demi-tasse for a Fall evening party-WOW!). 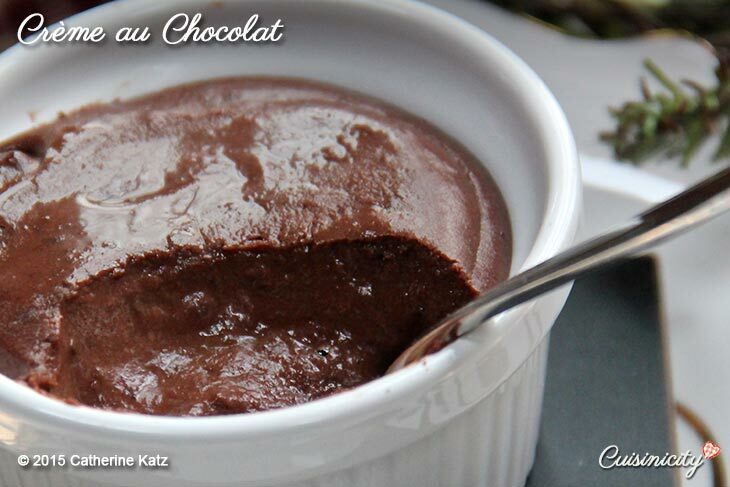 Even some gluten-free Desserts: Classic Mousse au Chocolat, served individually in little expresso cups…take a look! …and the list could go on! In fact, I would say that about every one of my recipes, with the exception of smoothies and breakfasts, are fair game for the holiday, so just peruse the website and pick whichever healthy recipe you deem worthy of your holiday table and please let me know if I should add a little mistletoe stamp of approval for them too. I wouldn’t be surprised…and that was my point all along! BON APPETIT and HAVE FUN WITH THIS! Catherine, I just wanted to send you and your family my best wishes for Christmas and the New Year. Thank you so much for your devotion to us, your readers. I am sending prayers to your Mother. I wish you and your family very happy holidays! I hope your mom is doing ok! So thank you for the inspiration! WOW!! Sybille,now I am going to need your recipe!! I am not kidding! You are so very welcome for the inspiration, I love how you just run with it and make it so special for your family,aways! I wish you a peaceful and healthy new year, filled with joy! Take care of your maman, Catherine. 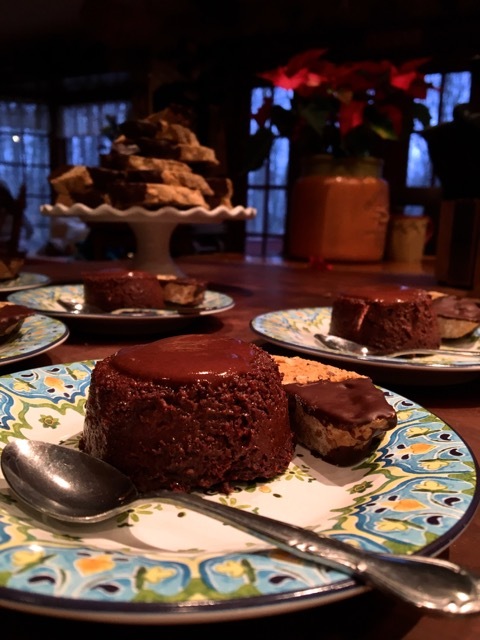 No worries about not posting a new blog…my heart went boom boom when I saw your chocolate recipes posted here and that Chocolate Lave Cake: OH MY!!! 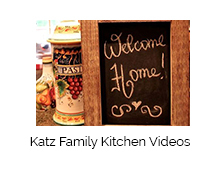 We are so spoiled to have your recipes come to us — just a click away! I wish you and your family all the best during the holiday season. Thanks again for all that you and David do! Take care of yourself. Thank you Julie, vous êtes ADORABLE! Votre petit mot me touche beaucoup, MERCI MERCI! I wish i could be as productive as you! I LOVE everything you make and post WOW!!! 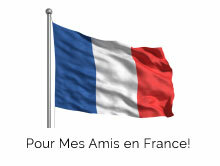 Je vous souhaite à vous et votre belle petite famille de belles fetes remplies de joie et de bonne santé bien sur!! Your email about dressing up some of your recipes for Christmas just arrived in my inbox. It’s so full of wonderful ideas that I hardly know where to begin. I’d just like to say thank you for Cuisinicity. It’s such an impressive and friendly site. I have tried lots of your recipes and they are always great. I hope your mother is doing better. It’s tough being far away from loved ones, especially at this time of the year. I wish you and your family a very merry Christmas and a happy and healthy New Year! Thank you sweet Anna!! You are so positive and just lovely, I am very touched, it makes it all worthwhile!! I wish you and your family a beautiful holiday!! Dear Catherine, There is nothing more important than family — in this case your mother. I do hope your trip was resolved in happiness or at least OK-ness. 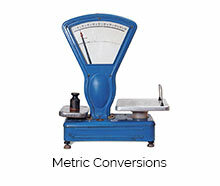 Thank you for these beautiful dishes we can emulate or at least try to copy in some fashion. I love being able to communicate here, like a best friend. You are so right, Donna! I echo your sentiments. Catherine, I hope this season brings health and happiness for your family. I love when you bring back a special post and give us some additions. It reminds me to go back and check out all of your rcipes. 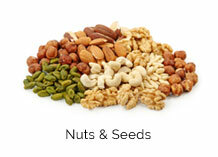 T’is the season to try something fancy, fun and packed with nutrition. Thank you Arlene!! I wish you a very happy and heartwarming holiday…filled with yummy recipes, and most importantly with good health and cheer! Thank you both Donna and Donna!!! I am so touched by your beautiful words and kindness! I wish you a wonderful holiday season and I look forward to sharing more yummy recipes with you next year!! 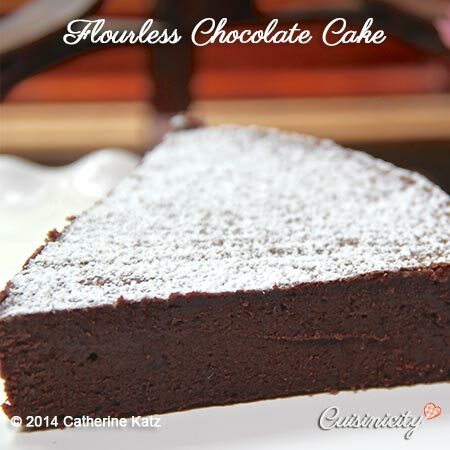 I have to go for the flourless chocolate cake as my favorite b/c well chocolate is chocolate. 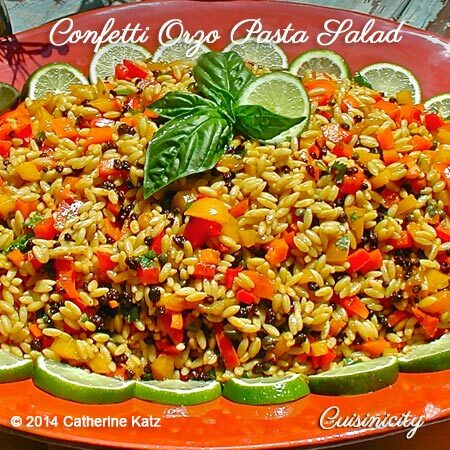 I have a party to go to and your confetti orzo salad would be a lovely contribution. Just looked at the ingredients and love it. I will have to follow your presentation of encircling it with lime slices. Happy Holidays to you Catherine. Always love to try new recipes from your website. You are inspiring us to eat healthier! The Orange Spinach Wild Salmon is one of my favorite recipes! 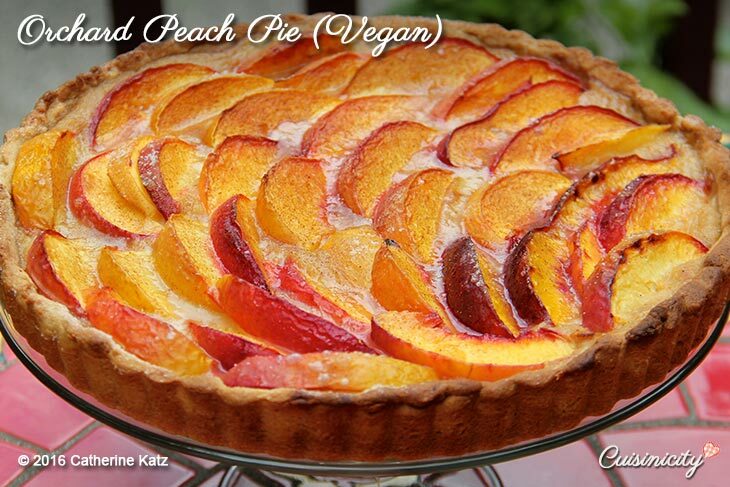 I am so looking forward to trying out more of your vegan recipes (especially the desserts) for the holidays! This is a fabulous website. I had no idea you could comment here! I have tried so many of your recipes and loved them!!! I have made some baked goods too. So many more I would like to try. 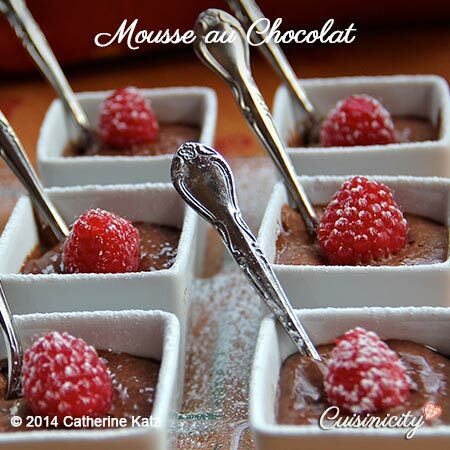 Thank you for such healthy and delicious recipes Catherine! Have a wonderful holiday and New Year! Catherine, do you have plans on publishing a print cookbook? I know everything is e(lectronic) now, but so many of us would love a copy to hold, with beautiful pictures to see. I would definitely buy a copy. I love that your dishes look elegant,sophisticated, healthy and delicious! and simple. I think you make ALL of us feel at home around your table, no matter our background. Thank you for that! 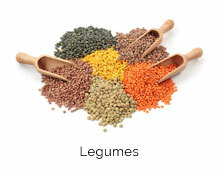 Catherine, I am a huge fan of your recipes and of the work and messages you and of course your husband relay. 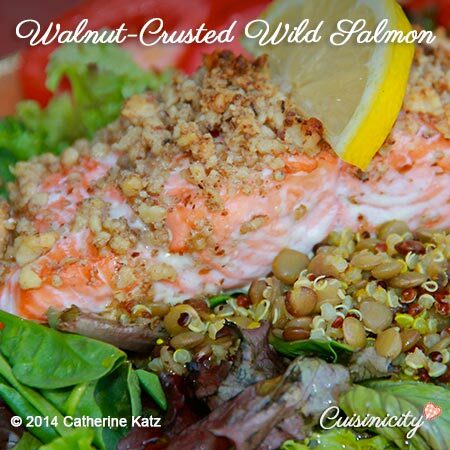 I especially love your walnut crusted salmon and your chocolate lava cake! Happy Holidays and all the best for 2017. 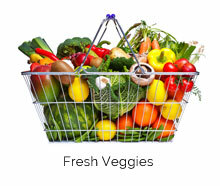 I enjoy your videos and how beautiful the healthy food is presented in pictures for reference. 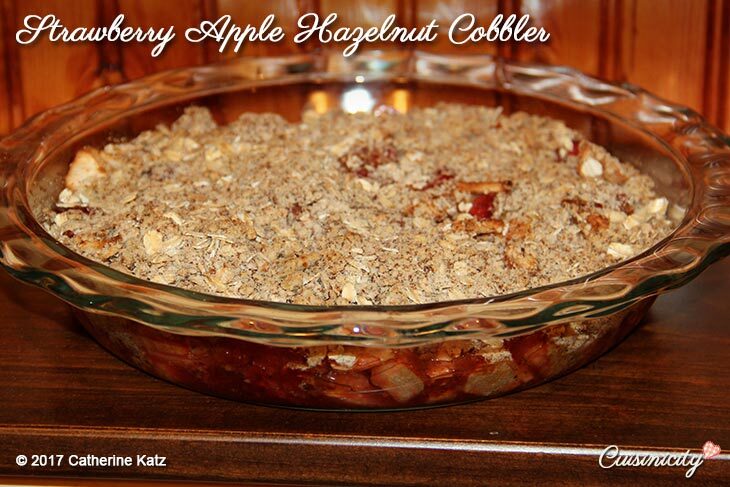 Very nice to have ideas for food that is good for you to share with others for the holiday. Thank you. Neighbors…so much so that when I put a new dish on the table, my husband laughs and says, “let me guess, it tastes great AND it’s good for us!” : ) Please keep up the great work, we’re enjoying it immensely! I’m a dietitian at a small rural hospital and have enjoyed making and sharing your chocolate goodies made with black lentils with my coworkers. They are always amazed at how good real, plant-based food tastes! Your Apple Walnut Scones were my favorite treat this past year. I try to eat vegan most of the time and because these were so delicious, I certainly didn’t miss the butter and sugar at all. 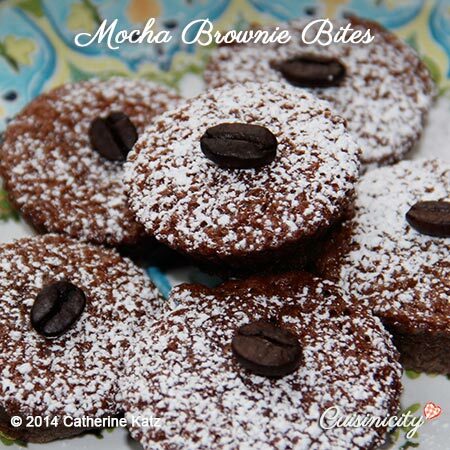 I’ve made them several times and they are always a hit in our home. Learning to cook the apples was a great trick and so easy to do. Thank you for a great recipe Catherine (and I really love your enthusiasm for healthy food that tastes great)! Your chicken tenders / Parmesan is a staple when I get together with my family. In fact it has been requested when we gather over the Christmas holiday. I am happy to do so. Happy Holidays to all! 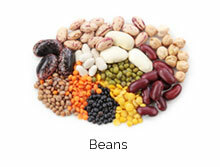 The simple way you present healthy food, food that continues to support traditions and family. Thank you for all of the knowledge you have shared and will continue to share. I just found your website through an on-line health summit that your husband participated in. I made your vegan burgers yesterday and loved them. 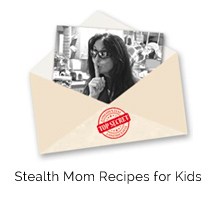 I can’t wait to try some of these recipes, as well! That makes me so happy Beth! WELCOME TO THE CUISINICITY TABLE!! 🙂 Which variation of my vegan burgers did you make? I have 3 wonderful recipes for them!! Hi, Catherine. 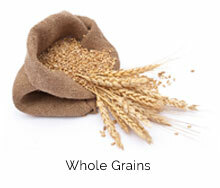 I am new to your beautiful and generous gift of shared healthy recipes. I would like to try the Turkey & Bean Pot-au-feu, but can’t seem to find 3 lbs organic, free-range Turkey Breast (split bone in, skinless)* in grocery stores in the New Haven , Ct area. Are you able to share some advice on this? Thank you very much. Welcome Eleanor! Thank you for your kind words! I love having you join me in the Cuisinicity kitchen!! I used to find it at the Whitneyville food Market in Hamden (http://whitneyvillefood.com), but they don’t always carry it, which is why I specify in the recipe that you can also make it with organic chicken thighs which also work well in this recipe and is absolutely lovely as well! I hope this is helpful! Thank you for a quick and wise response! It is like having a new friend to call on when I need cooking advice! I will try the chicken thighs in the recipe this weekend. Many thanks! I’m going to make a galette for my dad. And I think I’ll bring the artichoke dip to Christmas dinner. Can’t wait to share the results with you, Catherine! I am invited to a Holiday cocktail party and am wondering what appetizer I can bring that doesn’t need an oven/broiler… spinach dip? I don’t want to bother the hostess and ask to use her oven – thanks! Yes Greg, I think the Simply Spinach Dip is perfect for the occasion! After looking at all these. I am so hungry!!! Beautiful food and Great presentation. Who knew healthy food could make me feel so festive and recipes could be so entertaining to read?! Loved this, can’t wait to dress up my meals this holiday! Thank you Rebecca! I love that you enjoyed reading it as much as I did writing it! Let me know which dishes you dress up this holiday and take pictures I ALWAYS LOVE that!! bonsoir ! c’est féeerique ! c’est la Magie de Noël!!! 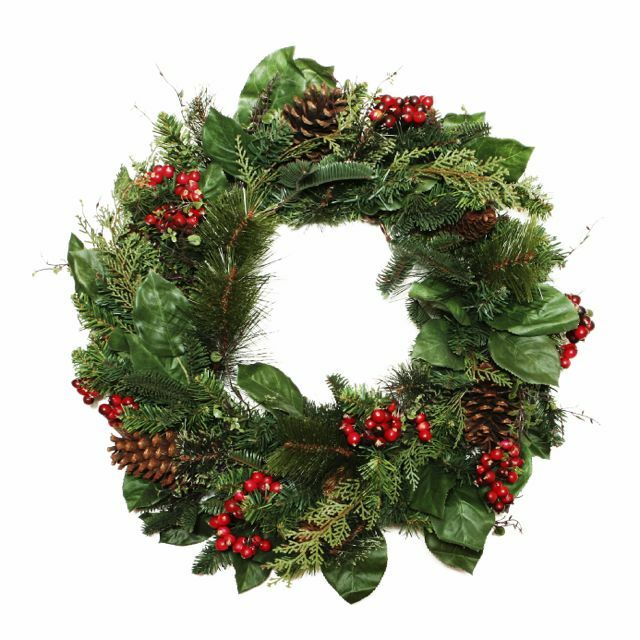 ….je sens que je vais piquer beaucoup de bien belles idées pour les fêtes de Noël!!! Merci Martine! Féerique est exactement le mot que j’adore pendant cette belle saison de fêtes!!! J’adore votre enthousiasme!